Ok! Got the whole kit laid out tonight to see what I've got and make sure everything is there. Everything I can see, except the oil pump O-ring, is here. 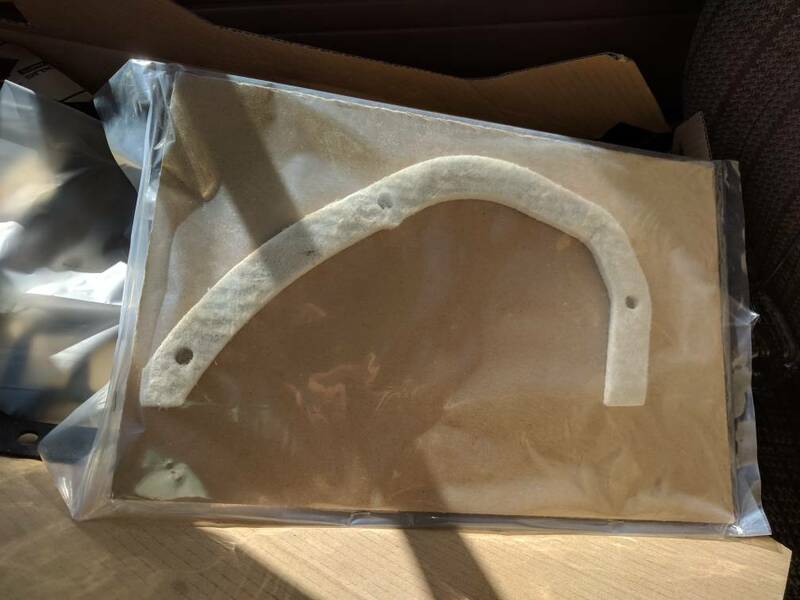 Even a drain plug gasket! 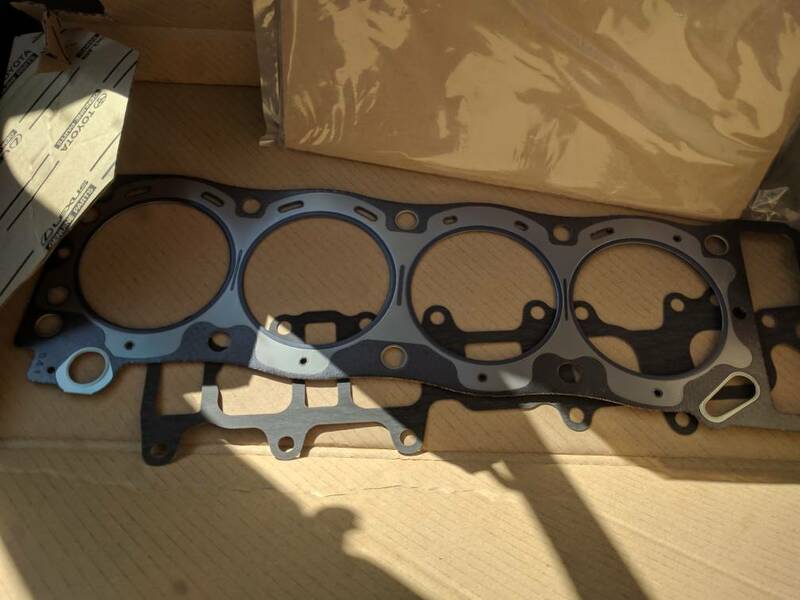 It also has a thermostat O ring gasket, and the water neck gasket itself. Great. 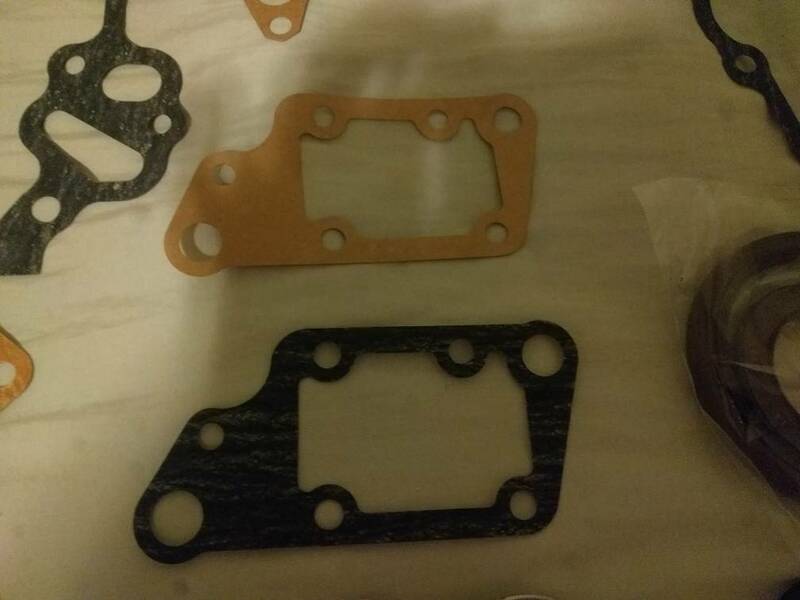 Something I noticed first hand, is how high quality the gaskets are, they are thick for one, compared to the thin timing cover gaskets that came with my OSK timing kit last time I did a timing job. 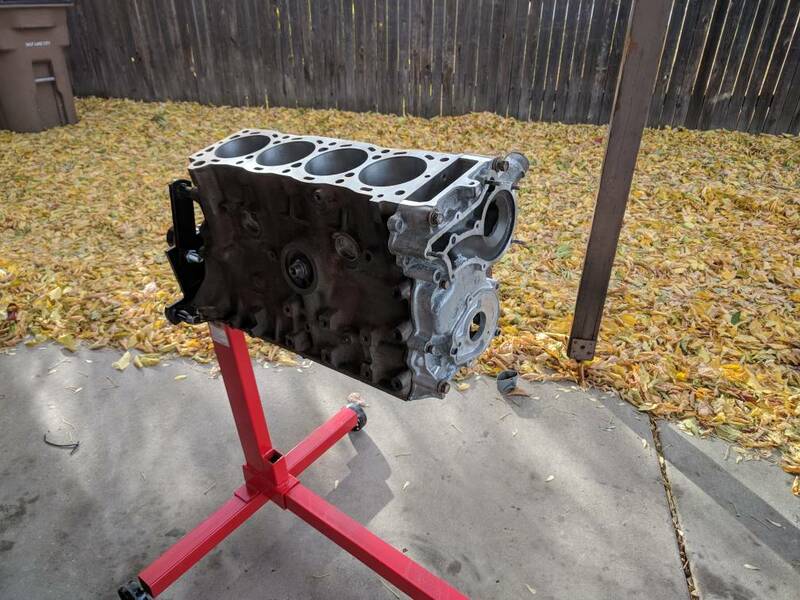 The head gasket itself looks great, don't necessarily know if it's gonna get used, it all depends on the condition of the head (which from my observation, is good) and the block. 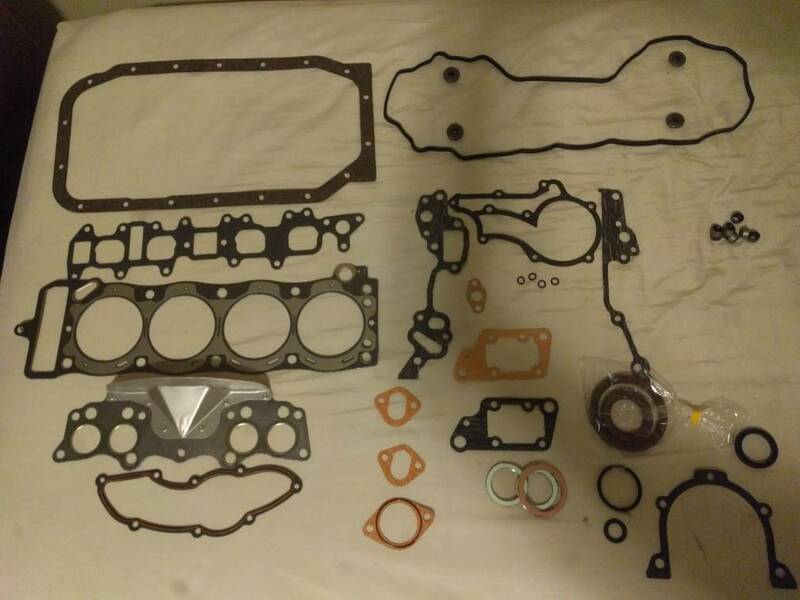 MLS head gaskets are really good and if need be, I'll use one. 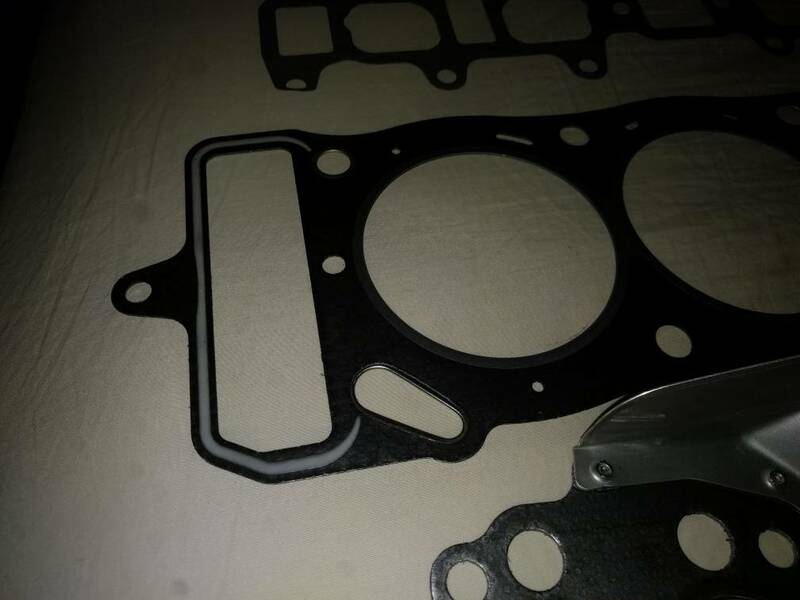 And, the old style cork gasket for the pan, which I plan to use RTV on because cork gaskets leak from my experience. Anyways, here's some pics. Super excited to get the ball rolling!!! 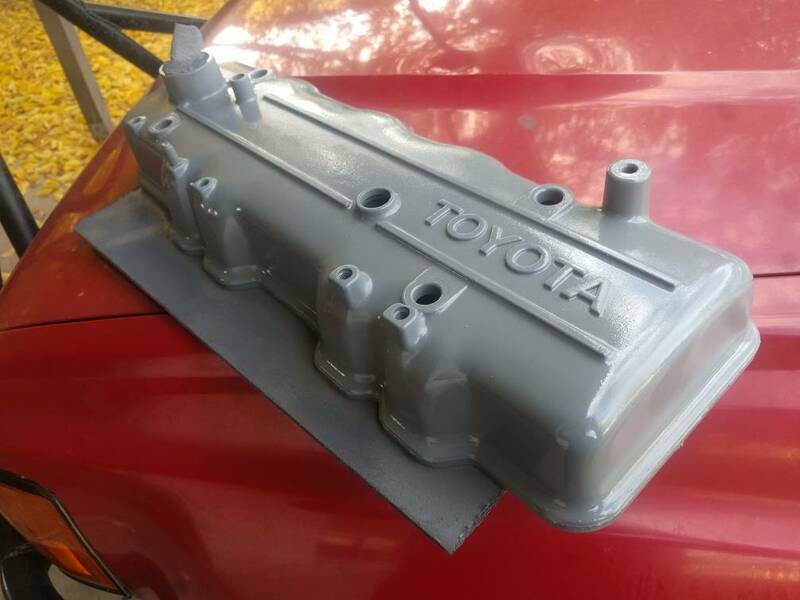 Painted the valve cover today, high heat engine primer and paint. Debating doing this to the timing cover as well. 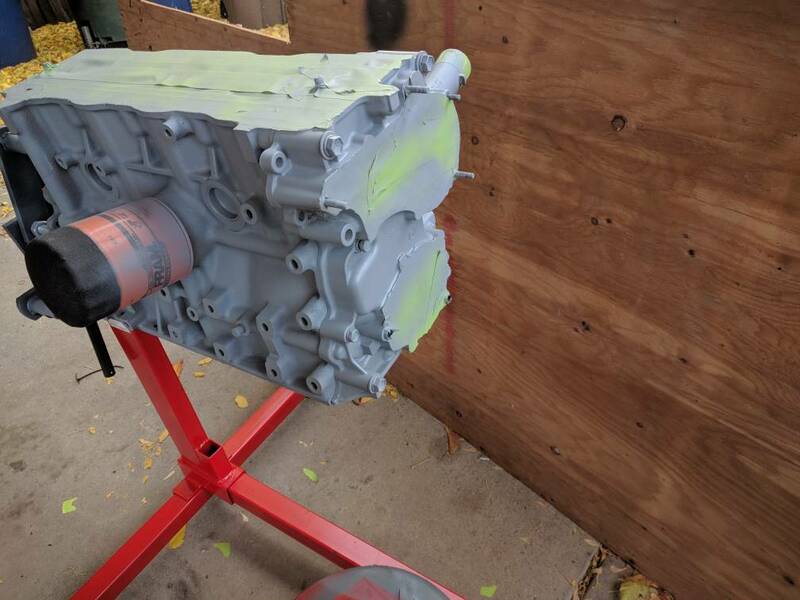 Definitely painting the block the same color. Got the block today. 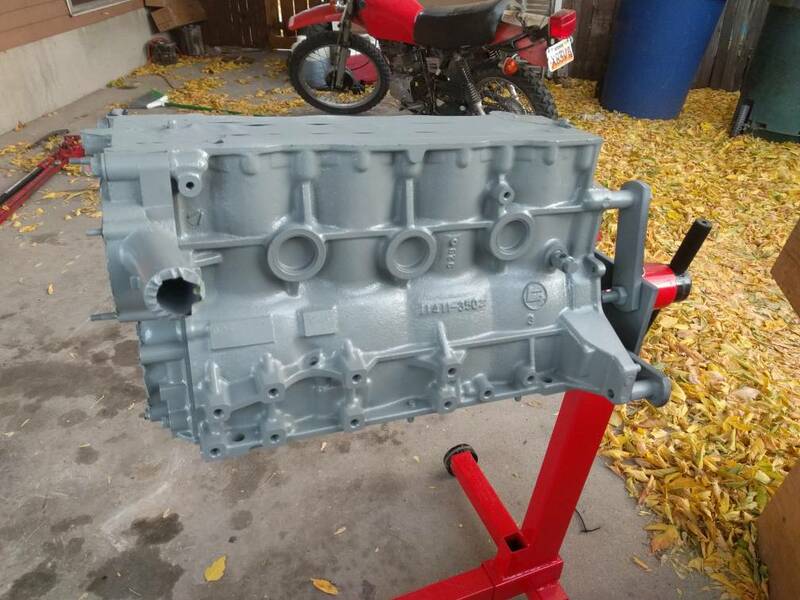 They only bored it .020" over, which makes me believe even more that it's an original block never bored before this. They decked it .009", which is good! 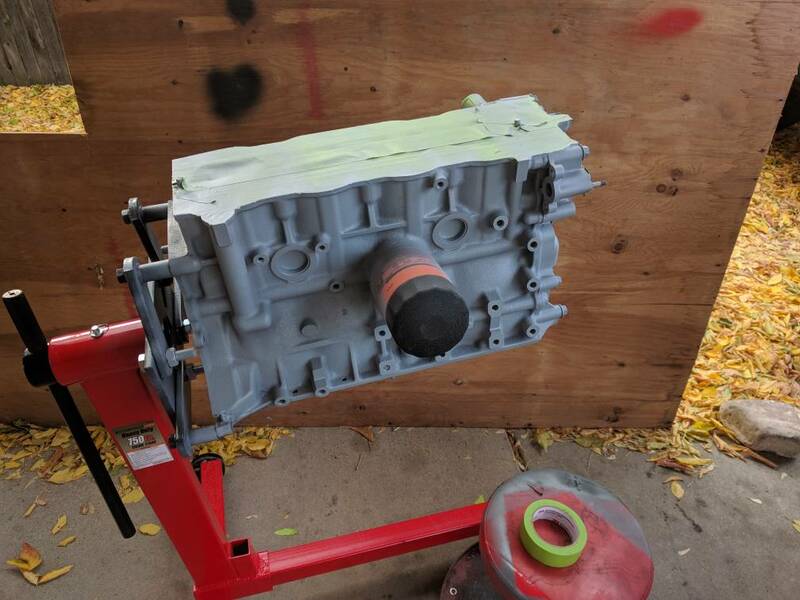 Here's it getting some high heat engine primer before the paint. I used the hammer technique to mask the areas off, it's so easy!! Also, the only time I will ever use a fram filter is to mask off the filter area. Looking nice and shiny! 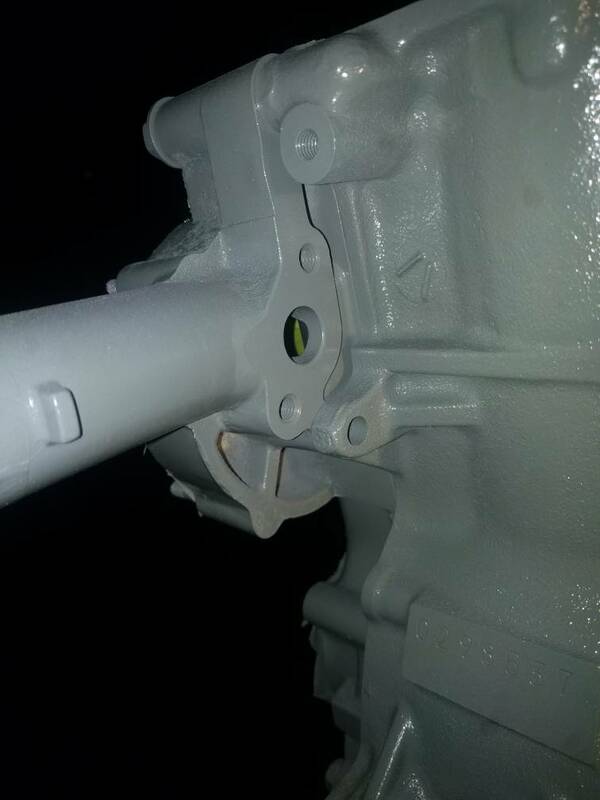 Looks like a marine diesel motor to me, the grey just gives it that look. Finishing up with clear coat. I used high heat everything, primer, paint, and now clear gloss. 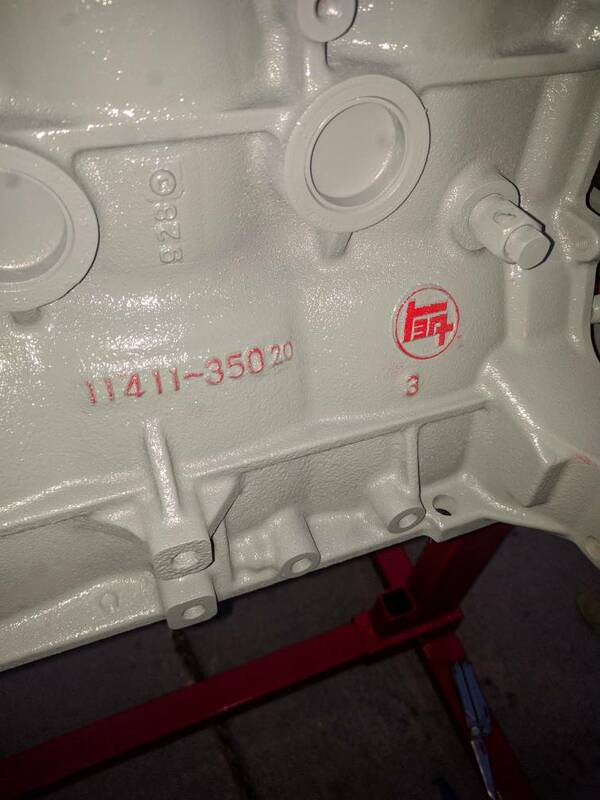 I also got some red paint on that classic yota logo, love the way it looks. I masked everything EXCEPT both the water pipe ports on the side of the block... Is there a way to remove this paint or is it fine? I'd just run a tap down the bolt holes. 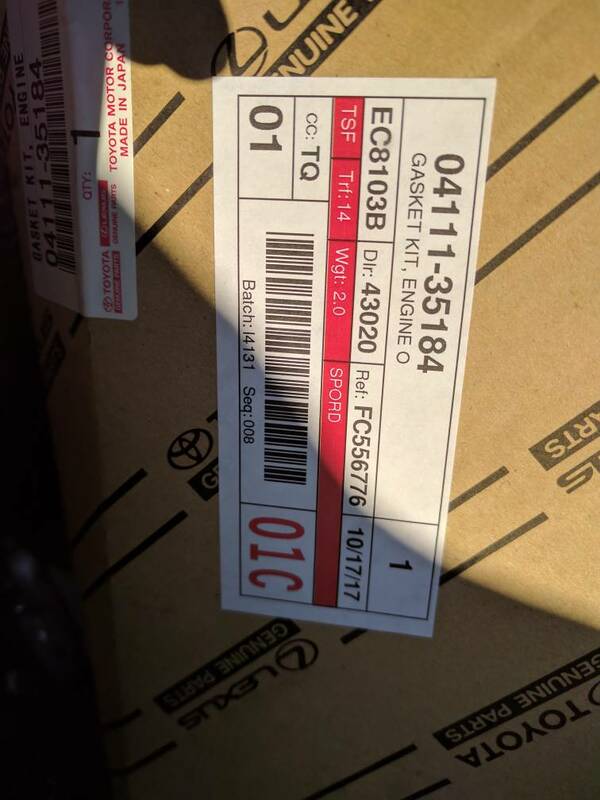 Is it fine to put gaskets on it? I plan on running one through. I would NOT use a blade, scraper, or sandpaper to remove it.... don't want any of that getting into the coolant passages. I would use lacquer thinner or MEK to soften and liquefy that paint and use a piece of cloth (t-shirt or shop rag) wrapped around the tip of phillips screwdriver, carefully pulling it out. Before I'd run a tap through threads, I'd make sure they bottom out and NOT go through into the coolant passages. Geezz.. great paint job... I wish I done that to my block. That will probably last the life of your engine and withstand all the degreaser and carwash spray cleaning you can put it through. Thanks, appreciate it! I've just spent the last 2 hours painting it. I just want something that's clean and looks great. Thanks for the tip. Will do. I'd probably leave the paint if its nice and smooth. I'd use Optimum Grey on that pipe and gasket. Be careful not to over torque those small bolts. 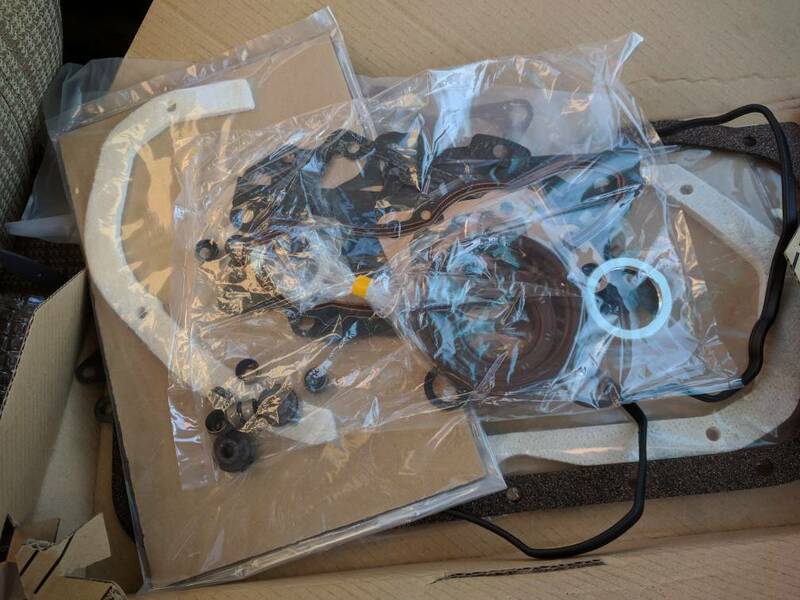 Thanks again, I have a huge box of all the hardware, 90% still has the zinc plating on it! Super excited to drain my bank account. Exactly that color!! Ford Grey. that thermostat o ring keeps the thermostat located in the hole and keeps coolant from getting passed it, use both it and the paper/fiber gasket. I usually tell guys to drill a tiny 1/8 hole in the thermostat itself but seeing you are in Utah I wouldnt do that. LOL..... try practicing THAT on Fordyce or the Rubicon!! Now... if and when you make it off the trail without toasting your starter.... then you get to do some serious practice "clutchless shifting", unless you are going to trailer it home. Regarding heavy-duty clutches, I think my experience may be relevant. I've been around two different Toyota clutches; a 2WD with a normal clutch and mine with some kind of super-duper clutch. I have a love-hate relationship with mine. I love the heavy-duty clutch in mine because I can remember burning out the clutch on the 2WD with a winter of busting snowdrifts in and out. That was not a good year. I can dish out abuse to my 4WD clutch with way more confidence because it is a heavy-duty unit. I actually have a heavy duty Marlin clutch, when I blew out my trans awhile back, I put one in along with a new Aisin slave cylinder. I love the clutch, I can't remember what load it is rated for. Thanks, I quickly researched and found out what they all belong to, it also has an oil cap O-ring, which is cool. It's got everything. ... I put one in along with a new Aisin slave cylinder. I kept a spare slave cylinder in my parts kits that went with me every time I went wheel'n, along with a small bottle of brake fluid. I like the idea of that, these slave cylinders get works pretty hard.